Robins Air Force Base is located in middle Georgia, 100 miles south of Atlanta and 16 miles south of Macon. Robins AFB is the largest industrial complex in Georgia. 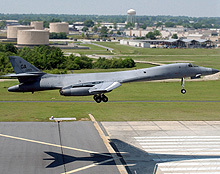 The base covers more than 6,934 acres, including Georgia’s largest runway. The runway is 12,000 feet long by 300 feet wide with two 1,000 foot overruns. Warner Robins Air Logistics Center, the host unit at Robins Air Force Base along with the 78th Air Base Wing and more than 60 other units contribute affordable combat superiority, readiness, and sustainability to the Air Force war fighting team.